Iran is interested in the rapid settlement of the Armenia-Azerbaijan Nagorno-Karabakh conflict, Iran's Ambassador to Azerbaijan Javad Jahangirzadeh said, Trend reports. 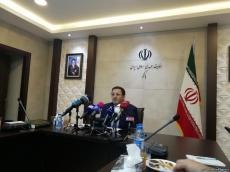 Jahangirzadeh made the remarks at a press conference in Baku on Feb. 8. "Iran believes the negotiations between the conflict parties are important," he noted. "Meetings of the heads of Azerbaijan and Armenia, as well as meetings of foreign ministers may play a big role in resolving the conflict." Of course, the OSCE Minsk Group is also trying to resolve this conflict, the ambassador said, adding that Iran supports a peaceful settlement of the conflict through negotiations.